Fast weight loss is a dream most of us want to realize at one time in our lives or another. Whether you want to slim down for your wedding, your 25th high school reunion or because you’re tired of huffing and puffing every time you walk up the stairs, a controlled weight loss plan will help you get there (and stay there). 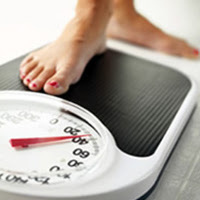 Fad diets that promise ultra-fast weight loss can compromise your health and, while they promise quick results, the pounds usually return as soon as the diet ends. But, if your heart is set on losing quickly, then you might as well do it in the healthiest way possible. These five tips will help you figure out what to do and not to do in an effort to shed the pounds. One pound is equal to 3,500 calories. Since most health professionals recommend losing 1 to 2 pounds per week, it’s best to divide these calories between diet and exercise. A reduction of 500 calories per day may sound like a lot, but you can achieve it by eliminating regular soda or coffee shop beverages from your diet. To burn 500 calories with daily exercise, go for a one-hour bike ride, jog or swim. If you’ve got more time on your hands, you can also burn 500 calories by walking briskly for two hours. The deficit you create by reducing your diet by 500 calories and burning the same with exercise will result in a two-pound weight loss each week. As you create a calorie deficit, remember that too much of a good thing can quickly turn sour. Cutting more calories than necessary can cause your body to go into starvation mode, causing it to hold onto fat, while exercising too long can lead to injury. Believe it or not, there are foods that promote weight loss. Consume vegetables and fruits with a high water content, such as watermelon and cucumbers. Eat healthy fats, like those found in almonds, avocadoes and fish. Avoid foods and beverages that can leave your belly bloated and your face puffy. Reduce or eliminate alcohol consumption, salty foods and foods that make you gassy. This tip alone can slim you down in a matter of days as you get rid of bloat and water weight caused by certain foods and drinks. Clinical trials have proven that drinking water before a meal is an effective way to lose weight. One study revealed that participants that drank two 8-ounce glasses of water before each of three daily meals lost 5 pounds more in 12 weeks than those who didn’t drink water. Fill a water bottle or large glass, and keep it handy. In addition to drinking water before you sit down to eat, sip on it throughout the day to feel full and hydrate your body. Losing weight is one of the hardest and simplest things to do. It requires effort, so if it sounds too good to be true, it probably is. As you put forth the effort by eating a healthy, calorie-reduced diet and exercising daily, be patient and give your body time to change. Even if you don’t see immediate results, your muscles are becoming toned, your fat is being burned and you are increasing your physical fitness. Samantha Rodgers loves to write about health related issues, most especially about healthy diet and fitness health.